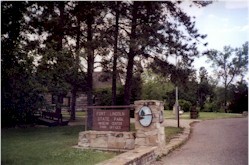 On the west side of the mighty Missouri River, Fort Abraham Lincoln Park encompasses history of legendary proportions. Lewis and Clark camped here, the Mandan Indians settled the On-A-Slant Village and General George A. Custer and his vaunted 7th Cavalry rode out from Fort Abraham Lincoln to their destiny at the Little Bighorn. On October 20, 1804 Captain Clark writes : " I saw an old remains of a village on the Side of a hill which the Chief with Too ne' tells me that nation lived in 2 (a number) villages 1 on each side of the river and the Troublesom Seaux caused them to move about 40 miles higher up where they remained a fiew years & moved to the place they now live". Reconstructed Mandan Indian earth lodges overlook the Heart and Missouri Rivers from a low bluff. 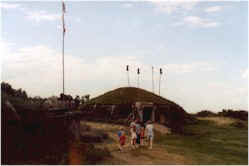 Each lodge is 30 to 40 feet in diameter and stands 10 to 12 feet high. At one time this village had a population of about 1000 people; but it was deserted by the time Lewis and Clark noted it in their journals. General George Custer's last cavalry post. 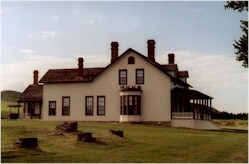 You'll enjoy seeing the reconstructed Custer home and other buildings on the cavalry and infantry post. 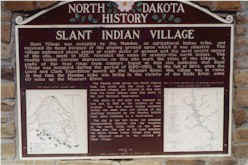 Museum with exhibits relating to the Mandan Indians, Lewis and Clark, fur traders and the military and settlement years. Whether you're planning a weekend getaway or a week-long vacation in Bismarck or Mandan, North Dakota, LewisandClarkTrail.com is your online connection for hotel reservations.